One of the most prosperous fragments of the brief world empire of Alexander the Great was Egypt, which fell to the share of the Ptolemy whose name we have already noted, as one of the associates of Alexander whom King Philip had banished. The country was at a secure distance from plundering Gaul or Parthian, and the destruction of Tyre and the Phoenician navy, and the creation of Alexandria gave Egypt a temporary naval ascendancy in the Eastern Mediterranean. Alexandria grew to proportions that rivalled Carthage; eastward she had an overseas trade through the Red Sea with Arabia and India; and westward her traffic competed with the Carthaginian. In the Macedonian and Greek governors of the Ptolemies, the Egyptians found a government more sympathetic and tolerable than any they had ever known since they ceased to be a self-governing empire. Indeed it is rather that Egypt conquered and annexed the Ptolemies politically, than that the Macedonians ruled Egypt. There was a return to Egyptian political ideas, rather than any attempt to Hellenize the government of the country. Ptolemy became Pharaoh, the god-king, and his administration continued the ancient tradition of Pepi, Thothmes, Rameses, and Necho. Alexandria, however, for her town affairs, and subject to the divine overlordship of Pharaoh, had a constitution of the Greek city type. And the language of the court and administration was Attic Greek. Greek became so much the general language of educated people in Egypt that the Jewish community there found it necessary to translate their Bible into the Greek language, many men of their own people being no longer able to understand Hebrew. Attic Greek for some centuries before and after Christ was the language of all educated men from the Adriatic to the Persian Gulf. Of all Alexander’s group of young men, Ptolemy seems to have done most to carry out those ideas of a systematic organization of knowledge with which Aristotle had no doubt familiarized the court of Philip of Macedon. Ptolemy was a man of very extraordinary intellectual gifts, at once creative and modest, with a certain understandable cynicism towards the strain of Olympias in the mind of Alexander. His contemporary history of Alexander’s campaigns has perished; but it was a source to which all the surviving accounts are deeply indebted. The Museum he set up in Alexandria was in effect the first university in the world. As its name implies, it was dedicated to the service of the Muses, which was also the case with the Peripatetic school at Athens. It was, however, a religious body only in form, in order to meet the legal difficulties of endowment in a world that had never foreseen such a thing as a secular intellectual process. It was essentially a college of learned men engaged chiefly in research and record, but also to a certain extent in teaching. At the outset, and for two or three generations, the Museum at Alexandria presented such a scientific constellation as even Athens at its best could not rival. Particularly sound and good was the mathematical and geographical work. The names of Euclid, familiar to every schoolboy, Eratosthenes, who measured the size of the earth and came within fifty miles of the true diameter, Apollonius, who wrote on conic sections, stand out. Hipparchus made the first attempt to catalogue and map the stars with a view to checking any changes that might be occurring in the heavens. Hero devised the first steam engine. Archimedes came to Alexandria to study, and remained a frequent correspondent of the Museum. The medical school of Alexandria was equally famous. For the first time in the world’s history a standard of professional knowledge was set up. Herophilus, the greatest of the Alexandrian anatomists, is said to have conducted vivisections upon condemned criminals. Other teachers, in opposition to Herophilus, condemned the study of anatomy and developed the science of drugs. But this scientific blaze at Alexandria did not endure altogether for more than a century. The organization of the Museum was not planned to ensure its mental continuity. It was a «royal» college; its professors and fellows (as we may call them) were appointed and paid by Pharaoh. «The republican character of the private corporations called the schools or academies at Athens was far more stable and independent». Royal patronage was all very well so long as Pharaoh was Ptolemy I, or Ptolemy II, but the strain degenerated and the long tradition of Egyptian priestcraft presently swallowed up the Ptolemies and destroyed the Aristotelian mentality of the Museum altogether. The Museum had not existed for a hundred years before its scientific energy was extinct. Side by side with the Museum, Ptolemy I created a more enduring monument to himself in the great library. This was a combination of state library and state publishing upon a scale hitherto unheard of. It was to be altogether encyclopaedic. If any stranger brought an unknown book to Egypt, he had to have it copied for the collection, and a considerable staff of copyists was engaged continually in making duplicates of all the more popular and necessary works. The library, like a university press, had an outward trade. It was a book-selling affair. Under Callimachus, the head of the library during the time of Ptolemy II and III, the arrangement and cataloguing of the accumulations was systematically undertaken. In those days, it must be remembered, books were not in pages, but rolled like the music-rolls of the modern piano-player, and in order to refer to any particular passage, a reader, had to roll back or roll forward very tediously, a process which wore out books and readers together. One thinks at once of a simple and obvious little machine by which such a roll could have been quickly wound to and fro for reference, but nothing of the sort seems-to have been used. Every time a roll was read it was handled by two perspiring hands. It was to minimize the waste of time and trouble that Callimachus broke up long works, such as the history of Herodotus, into «books» or volumes, as we should call them, each upon a separate roll. The library of Alexandria drew a far vaster crowd of students than the teachers of the Museum. The lodging and catering for these visitors from all parts of the world became a considerable business interest for the Alexandrian population. 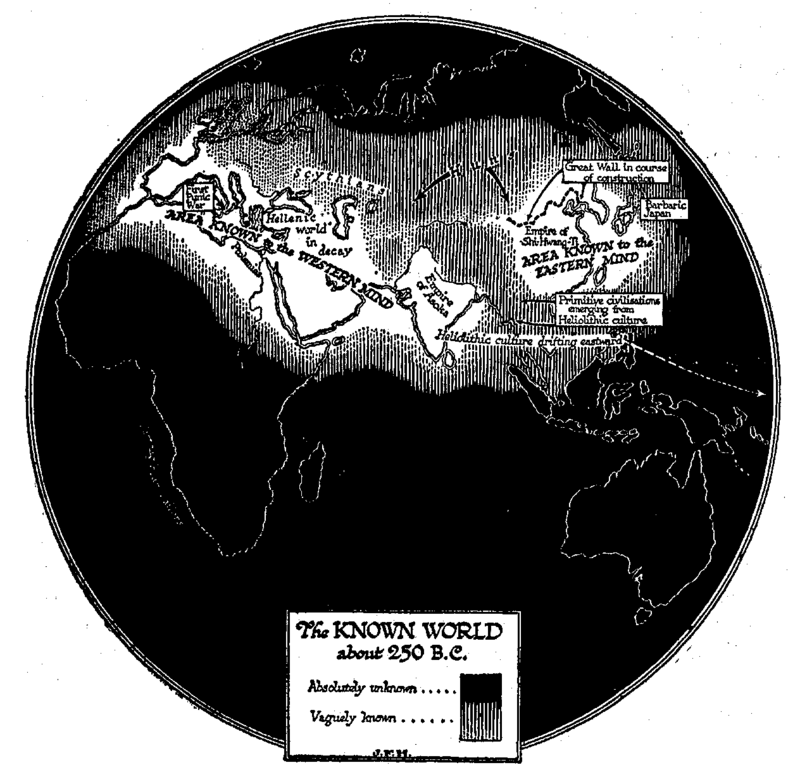 Figure 346: The Known World, about 250 B.C. It is curious to note how slowly the mechanism of the intellectual life improves. Contrast the ordinary library facilities of a middle-class English home, such as the present writer is now working in, with the inconveniences and deficiencies of the equipment of an Alexandrian writer, and one realizes the enormous waste of time, physical exertion, and attention that went on through all the centuries during which that library flourished. Before the present writer lie half a dozen books, and there are good indices to three of them. He can pick up any one of these six books, refer quickly to a statement, verify a quotation, and go on writing. Contrast with that the tedious unfolding of a rolled manuscript. Close at hand are two encyclopaedias, a dictionary, an atlas of the world, a biographical dictionary, and other books of reference. They have no marginal indices, it is true; but that perhaps is asking for too much at present. There were no such resources in the world in 300 B.C. Alexandria had still to produce the first grammar and the first dictionary. This present book is being written in manuscript; it is then taken by a typist and typewritten very accurately. It can then, with the utmost convenience, be read over, corrected amply, rearranged freely, retyped, and recorrected. The Alexandrian author had to dictate or recopy every word he wrote. Before he could turn back to what he had written previously, he had to dry his last words by waving them in the air or pouring sand over them; he had not even blotting paper. Whatever an author wrote had to be recopied again and again before it could reach any considerable circle of readers, and every copyist introduced some new error. Whenever a need for maps or diagrams arose, there were fresh difficulties. Such a science as anatomy, for example, depending as it does upon accurate drawing, must have been enormously hampered by the natural limitations of the copyist. The transmission of geographical fact again must have been almost incredibly tedious. No doubt a day will come when a private library and writing-desk of the year A.D. 1919 will seem quaintly clumsy and difficult; but, measured by the standards of Alexandria, they are astonishingly quick, efficient, and economical of nervous and mental energy. No attempt seems to have been made at Alexandria to print anything at all. That strikes one at first as a very remarkable fact. The world was crying out for books, and not simply for books. There was an urgent public need for notices, proclamations, and the like. Yet there is nothing in the history of the Western civilizations that one can call printing until the fifteenth century A.D. It is not as though printing was a recondite art or dependent upon any precedent and preliminary discoveries. Printing is the most obvious of dodges. In principle it has always been known. As we have already stated, there is ground for supposing that the Palaeolithic men of the Magdalenian period may have printed designs on their leather garments. The «seals» of ancient Sumeria again were printing devices. Coins are print. Illiterate persons in all ages have used wooden or metal stamps for their signatures; William I, the Norman Conqueror of England, for example, used such a stamp with ink to sign documents. In China the classics were being printed by the second century A.D. Yet either because of a complex of small difficulties about ink or papyrus or the form of books, or because of some protective resistance on the part of the owners of the slave copyists, or because the script was too swift and easy to set men thinking how to write it still more easily, as the Chinese character or the Gothic letters did, or because of a gap in the social system between men of thought and knowledge and men of technical skill, printing was not used not even used for the exact reproduction of illustrations. The chief reason for this failure to develop printing systematically lies, no doubt, in the fact that there was no abundant supply of printable material of a uniform texture and convenient form. The supply of papyrus was strictly limited, strip had to be fastened to strip, and there was no standard size of sheet. Paper had yet to come from China to release the mind of Europe. Had there been presses, they would have had to stand idle while the papyrus rolls were slowly made. But this explanation does not account for the failure to use block printing in the case of illustrations and diagrams. 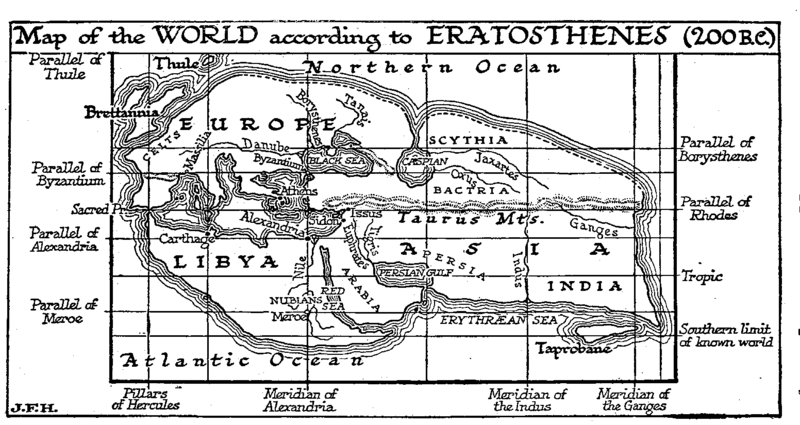 These limitations enable us to understand why it was that Alexandria could at once achieve the most extraordinary intellectual triumphs-for such a feat as that of Eratosthenes, for instance, having regard to his poverty of apparatus, is sufficient to put him on a level with Newton or Pasteur-and yet have little or no effect upon the course of politics or the lives and thoughts of people round about her. Her Museum and library were a centre of light, but it was light in a dark lantern hidden from the general world. There were no means of carrying its results even to sympathetic men abroad except by tedious letter-writing. There was no possibility of communicating what was known there to the general body of men. Students had to come at great cost to themselves to this crowded centre because there was no other way of gathering even scraps of knowledge. At Athens and Alexandria there were bookstalls where manuscript note-books of variable quality could be bought at reasonable prices, but any extension of education to larger classes and other centres would have produced at once a restrictive shortage of papyrus. Education did not reach into the masses at all; to become more than superficially educated one had to abandon the ordinary life of the times and come for long years, to live a hovering existence in the neighbourhood of ill-equipped and overworked sages. Learning was not indeed so complete a withdrawal from ordinary life as initiation into a priesthood, but it was still something in that nature. And very speedily that feeling of freedom, that openness and directness of statement which is the vital air of the true intellectual life, faded out of Alexandria. From the first the patronage even of Ptolemy I set a limit to political discussion. Presently the dissensions of the schools let in the superstitions and prejudices of the city mob to scholastic affairs. Wisdom passed away from Alexandria and left pedantry behind. For the use of books was substituted the worship of books. Very speedily the learned became a specialized queer class with unpleasant characteristics of its own. The Museum had not existed for half a dozen generations before Alexandria was familiar with a new type of human being; shy, eccentric, unpractical, incapable of essentials, strangely fierce upon trivialities of literary detail, as bitterly jealous of the colleague within as of the unlearned without, the bent Scholarly Alan. He was as intolerant as a priest, though be had no altar; as obscurantist as a magician, though he had no cave. For him no method of copying was sufficiently tedious and no rare book sufficiently inaccessible. He was a sort of by-product of the intellectual process of mankind. For many precious generations the new-lit fires of the human intelligence were to be seriously banked down by this by- product. Right thinking is necessarily an open process, and the only science and history of full value to men consist of what is generally and clearly known; this is surely a platitude, but we have still to discover how to preserve our centres of philosophy and research from the caking and darkening accumulations of narrow and dingy-spirited specialists. We have still to ensure that a man of learning shall be none the less a man of affairs, and that all that can be thought and known is kept plainly, honestly, and easily available to the ordinary men and women who are the substance of mankind.